Fiesta is over, and it is time for the hot summer to continue. High pressure has built in once again with summer heating and Santa Anna winds heating us up once again. The next few days will bring hot weather, with everyone in the 90s and great places like woodland hill reaching close to 110 degrees. Hot weather is not the only threat, we will have a Santa Anna wind event the next 2 days. Winds will blow from the northeast, so Montecito and points south like Ventura will be most affected by this event. Tuesday will be the hottest day of the week. Wednesday, we can see some marine layer arriving, but do not expect a lot of cooling. As far as the hurricane front goes to the south and west, it is getting crazy out there. 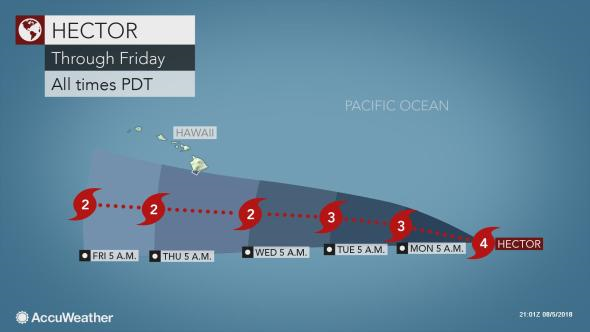 There are now 3 named tropical storms out in the Pacific, and one more that should be named in the new few days. Hector is to your far left, can’t really see it. This is going to brush Hawaii’s big island later in the week. Nature will create a challenge with the volcano, and the hurricane for the big island of Hawaii. Thank you Action Roofing! On a ridiculously busy and rainy day like yesterday, I greatly appreciate you taking care of my client’s leaking roof. As a realtor, I make sure to always take care of my client’s needs before, during and after our transaction. It is wonderful to have a great company like Action Roofing to rely on to do the same! Thank you!! !